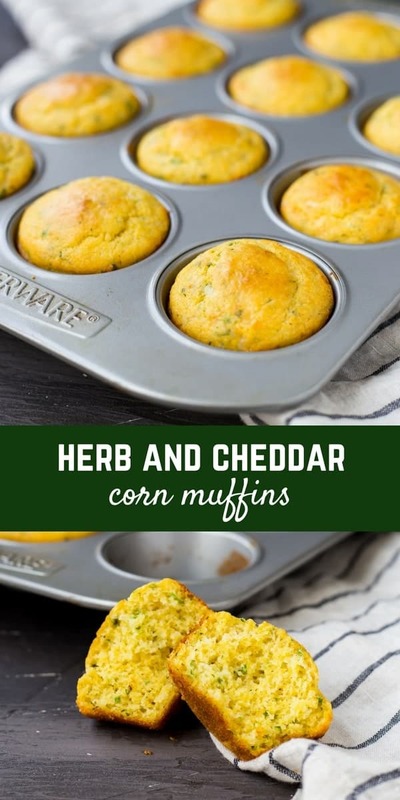 This Cornbread Muffin Recipe with Herbs and Cheddar takes your standard corn muffins up a notch thanks to flavorful herbs and rich, sharp cheddar. They’re perfect with a bowl of chili! 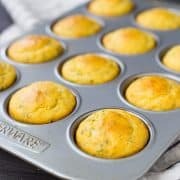 My family just adores cornbread and cornbread muffins. Ben would never express these thoughts aloud because he’s grateful to have a hot meal waiting for him almost every night, but I know he gets a little secretly annoyed when I make chili and don’t make cornbread to go with it. He’d deny it if I asked but I know it’s true. 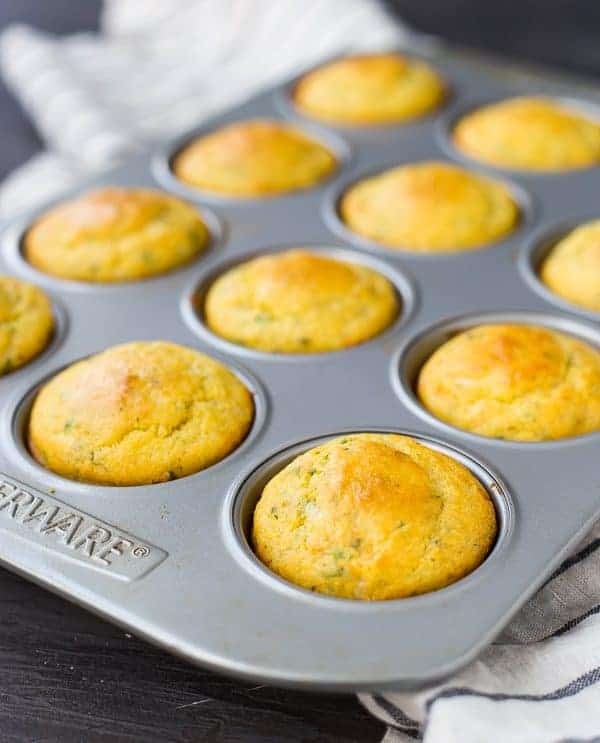 More often than not, I make a this healthy cornbread recipe made with whole wheat flour, olive oil, and maple syrup instead of all-purpose flour, canola oil, and granulated sugar. 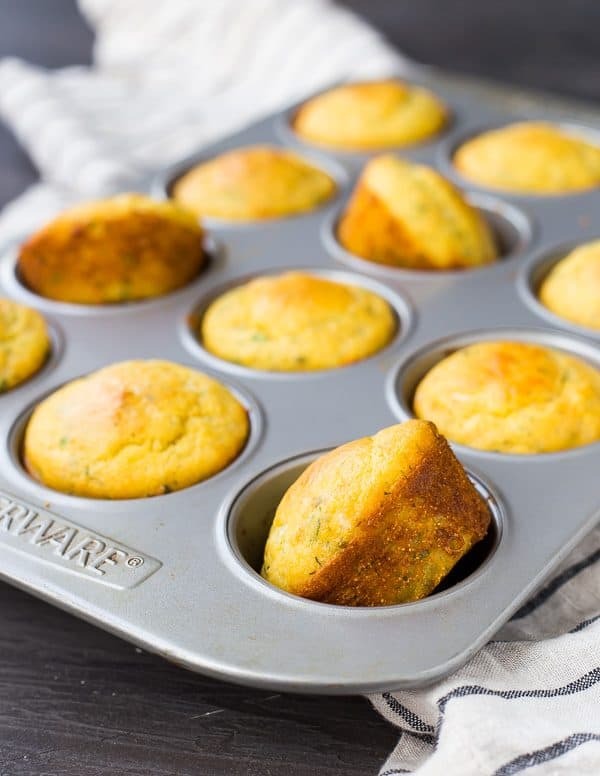 When I was developing this cornbread muffin recipe for you guys, I decided to stick with all-purpose flour. I really wanted those bright green herbs and the sharp cheddar to shine through and not get lost behind the slightly nutty flavor of whole wheat flour. When I was choosing herbs, I was looking for bright and fresh flavors but nothing that would overpower and dominate the flavor. I chose fresh parsley and dried chives and dill. It also corresponded with what I happened to have on hand. That’s what I love about cooking. If you the store doesn’t have fresh chives, as was the case for me, dried will work great here. I always have dried dill weed on hand so I sprinkled a little in (not too much, though, because dill has a very strong flavor). My parsley is doing okay in my little herb garden so I went out and cut some of that. But if you want to go a different route, try some basil, thyme or even rosemary. Rosemary is potent too, so make sure to use it in moderation. The possibilities and combinations are endless! 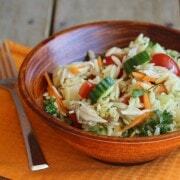 I of course recommend you start with this recipe, but I’d love to hear what other combinations you might try! Want more muffin recipes? I know you do! Preheat oven to 450 degrees Fahrenheit. 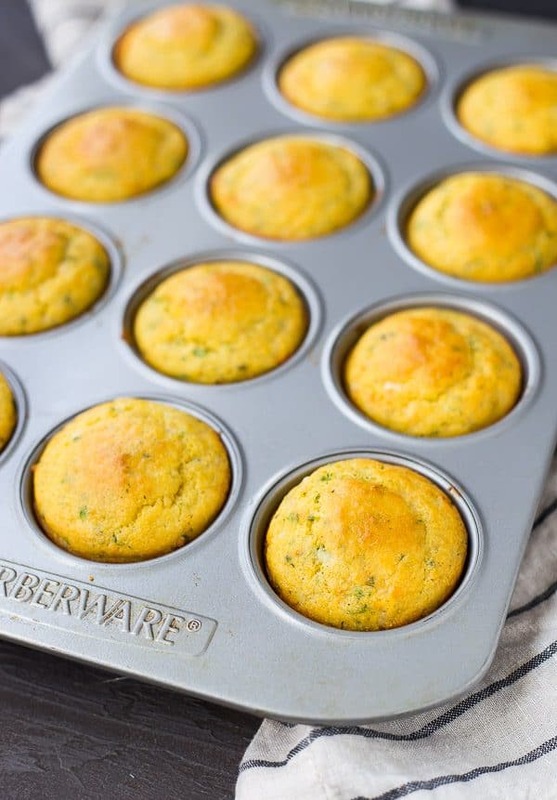 Spray a muffin tin with 12 cups with nonstick cooking spray. 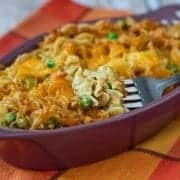 In a medium-size mixing bowl, whisk together flour, cornmeal, sugar, baking powder, salt, pepper, chives, parsley, dill, and cheddar until combined. 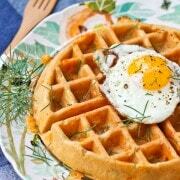 In a large measuring cup or small bowl, whisk together milk, olive oil, and eggs. Pour over dry mixture and stir until combined and no lumps remain. Fill each muffin cup in tin about 2/3rds of the way full. Bake for 15-17 minutes or until golden brown. Let cool for 3-4 minutes before removing from muffin tin to cooling rack (or your dinner plate!). 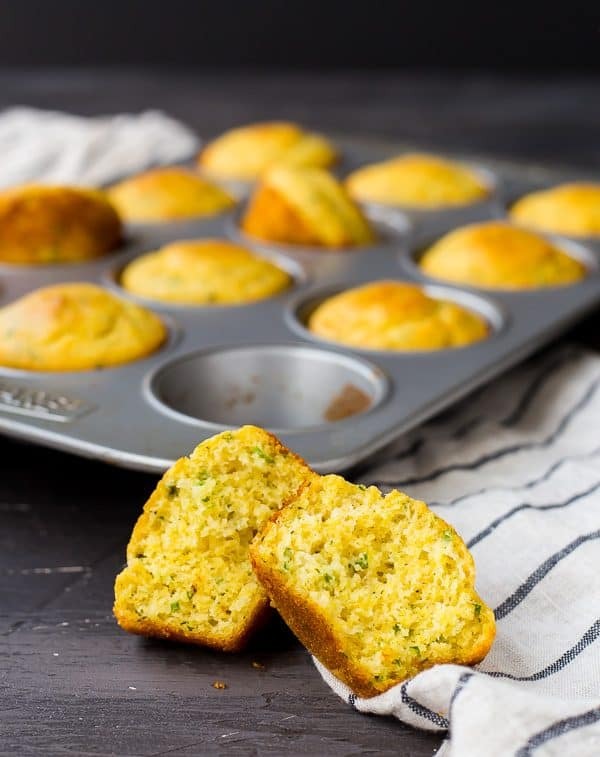 Verdict: I love this savory cornbread muffin recipe – it’s a nice change from my more traditional recipe. Husband’s take: Ben liked these, but he’s a traditionalist and I could tell he likes my other recipe better. Changes I would make: None are necessary, of course, but check out my ideas earlier in this post if you’d like to experiment a little. Oh yes; and I could bring leftovers ( if any left) to my office for work lunch ! Thank you so much !